Gael quite rightly suspected that the new, stronger lead screw I developed for the bicep would clash when it tried to seat in the recess in bottom of the RotGear. 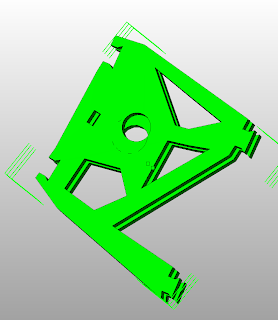 Raising the hole that the thrust collar axis seats in by 11.5 mm sorted that problem out quite prettily. Here you can see the revised HighArmSide part that supports the thrust collar. I've overlaid the revised design over the old. As you can see the new mounting hole has been moved upward a bit. I simply plugged the old hole and cut a new one in the STL file. Here is the forearm at full extension. Contracting the forearm towards the bicep at the elbow. Fully contracted, the lead screw slides into the recess in the bottom of the RotGear which allows the bicep to rotate in a perpendicular plane to its axis. Removing RotGear you can see the lead screw seated where the recess in the bottom of the RotGear is. Yes this is what had to be done! Can you now get the lead screw completly screwed up to the flat surface of the thrust collar or is it at the maximum on your pictures? The elbow as I designed it, is only folding to a 90 degree angle, it isn't enough compared to human angle. Each millimeter on that lead screw is precious. "is it at the maximum on your pictures?" No, it will go all the way. "Each millimeter on that lead screw is precious."